Firstly we will stop at Mengwi, to visit the magnificent royal family temple of Taman Ayun(XVII century) surrounded by a moat, then we will explore the Bedugul area. A mountain resort lies over 1000 meters above sea level. 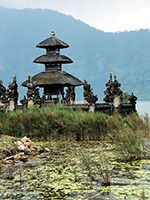 We will stop at Ulun Danu Bratan Temple, built on promontory surrounded by lake’s water. Afterwards, we will visit at colourful local fruit market that displays many kinds of tropical fruit, vegetables, flowers and spices. Then we proceed to Bali Botanical Garden, with a large collection of plants from all over the world set in lovely garden and well manicured lawns, a peaceful refugee from daily activities in a bustling city. Continuing the trip, we will proceed to Alas Kedaton, to see fruit bats and the monkey forest. 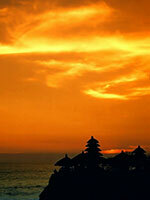 Our next stop is the marine temple of Tanah Lot. This lovely temple was built on a cliff promontory, truly a perfect setting to watch the stunning sunset (weather permitting). 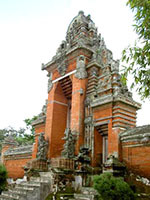 Bali Bedugul Botanical Garden is located in at bedugul village, baturiti district, tabanan regency, 1240 meters above sea level, it is about 62 km from denpasar and can be reach by motorcycle as the road are fairly goods. Bali botanical garden is unique in Bali as a place for botanical research, conservations, recreation, and educations, it provide a place where you can relax in beautiful an peaceful surrounds while learning about the function of plants in the daily life of Balinese as well as some interesting rain forest plantations and birdlife.